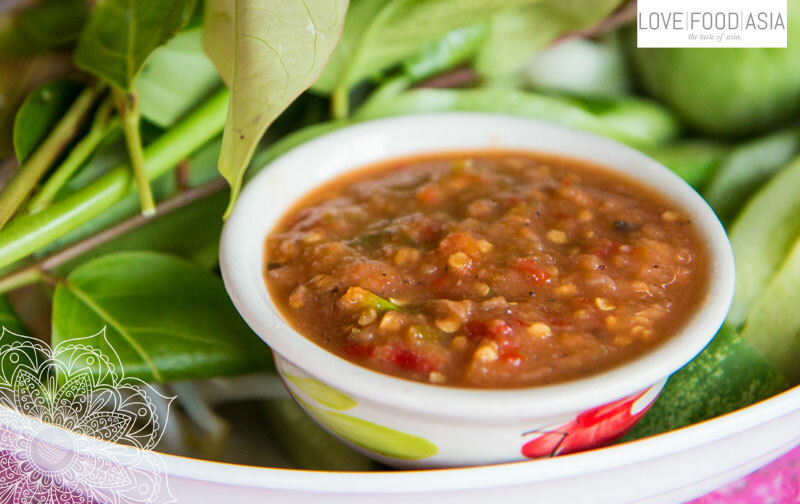 When it comes to Thai chili dipping sauces (known in Thai as nam prik or nam phrik) nothing is more common or widely loved than nam prik kapi. This Chili dip is perhaps the most famous of all the Thai chili sauces next to Nam Pla Prik (น้ำปลาพริก). It is made with fermented shrimp paste, chilies, and lots of lime juice. Grill 2 tbs shrimp paste (Formed into a patty) for 2 minutes. Set aside. Add shallots, garlic and chili to a mortar and pestle for about 10 minutes until you get a smooth paste. Add about 10 pea eggplant to the mortar, and gently crush them, just to release the seeds. Add shrimp paste and palm sugar and pound for about a minute. Pour in 3 tbs lime juice and mix well. The Nam Prik Kapi should be like a sauce in texture, and should be salty, sour, and spicy, with only a faint hint of sweetness. Add more lime juice or chilies as needed to balance the taste. Once finished, garnish with whole Thai bird’s eye chilies and more pea eggplant.